Lenovo REACHit app now available on Windows store. 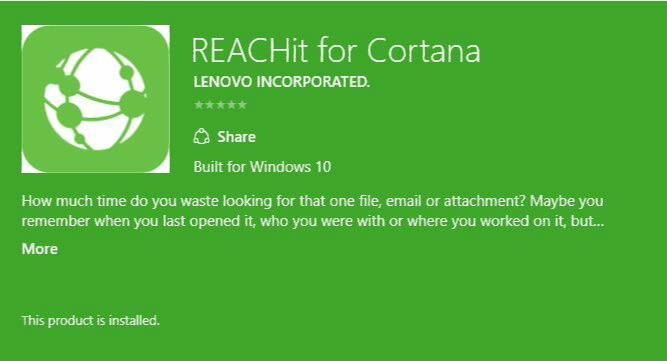 REACHit app is an extension that allows a user to tap into Cortana on Windows 10 to offer a much larger inventory of information to search. Lenovo REACHit app for Cortana will find your photos, documents, and emails faster than you can, and with a lot less stress. REACHit is a Lenovo and Microsoft collaborated project. Use natural language to find your content wherever it is. Contextual search lets you find content based on what it’s about, where you were, or who you were with. Find files on different Windows 10 PCs and Tablets. Find email and attachments in Exchange and Gmail accounts. Find files in OneDrive, GoogleDrive, and Dropbox accounts.